The date time indexing logic that ships with Sitecore 7 Content Search is partially flawed. Neither the logic storing nor retrieving DateTime values is capable of handling changes to ContentSearch.DateFormat. 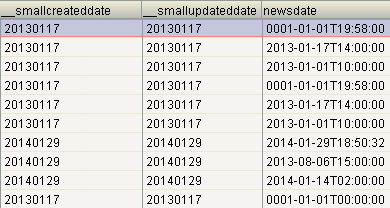 This means that DateTime values will lose any information reg. hours, minutes, seconds etc. when being stored in the indices, no matter what date time format is specified in the content search configuration. The standard DateFieldReader always stores the field contents with a date resolution of DAY, hence ignoring the above setting. This means that out of the box, the hour, minute and second parts of a Sitecore DateField will not be stored regardless of the ContentSearch.DateFormat used. Fortunately it’s easy to replace the default DateFieldReader with a custom implementation via the content search configuration files. Unfortunately, once a DateFieldReader has been implemented which respects the ContentSearch.DateFormat, format exceptions will be thrown when working with types derived from Sitecore.ContentSearch.SearchTypes.SearchResultItem (“String was not recognized as a valid DateTime”). The following article describes a fix to the issues outlined above by overriding the default DateFieldReader and IndexFieldDateTimeValueConverter, in addition to introducing a setting for “alternate date time formats”. A crawler reads items from Sitecore. 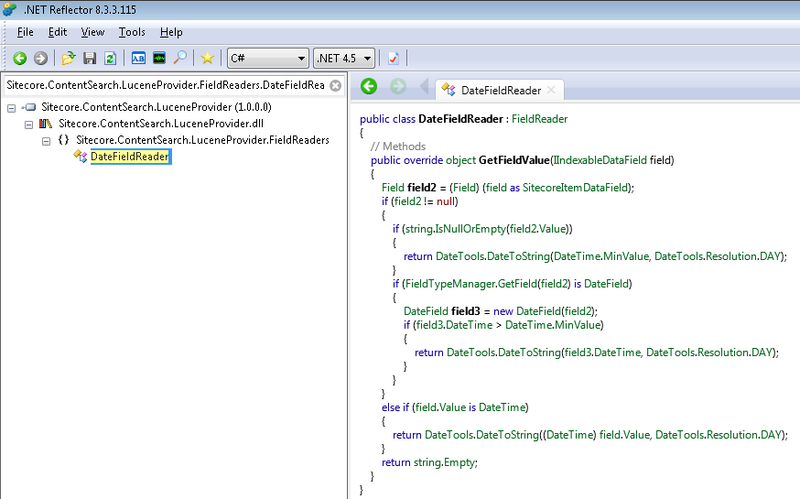 Each item’s fields are read by matching FieldReader implementations (e.g. DateFieldReader, CheckboxFieldReader, ImageFieldReader). The field value is converted to a string and stored in the index. When retrieving content directly from the index (i.e. when using a class containing properties marked with the Sitecore.ContentSearch.IndexFieldAttribute and Linq-to-Sitecore) a TypeConverter parses the stored value to an instance of the appropriate runtime type. To replace the default FieldReader and TypeConverter with our custom implementations, save the configuration shown below to a .config-file (e.g. “z.ContentSearch.DateTimeFix.config”) and place it in the “App_Config/Include”-folder. Modify namespace and assembly names as needed. Additional information: Cannot cast from ‘System.String’ to ‘Sitecore.ContentSearch.ProviderIndexConfiguration’. The error message you’ve encountered sounds familiar; if you’re experiencing the issue I’m thinking of, it’s caused by the order in which config-include files are read by Sitecore. EITHER prefix your config-include filename with something like “z”, e.g. rename it from “my-file.config” to “z-my-file.config”. This should work because Sitecore reads the config-files in lexicographical order, so prefixing your file with “z” makes sure it’s included after the default search configuration files (“Sitecore.ContentSearch.XYZ.config” etc.). OR move your config-include file to a subfolder of the Include-directory, e.g. move it from “/App_Config/Include/my-file.config” to “/App_Config/Include/K-J/my-file.config”. This should work because Sitecore reads config-files in subdirectories after files in the top directory. Nice article – just what I needed. Just a quick note on the prefixing with “z” to ensure the files are loading in the right order. If you put your include files in a sub-folder inside the Include folder, Sitecore will load in the Include folder first and then all the Sub Folders, I’ve moved all my include files to sub folders now and it works great! I know this was a long time ago, but I was wondering if you ever figured out what was causing the patched version of the setting to be different than the one in the patch file? What you’re describing sounds like an issue related to the order in which config include files are applied/read from disk. If you’re using config include files, try putting them in a subfolder, e.g. “App_Config/Include/MyFiles/DateTimeFormat.config”. Or you might be using a different version of Sitecore than I did at the time. Part of the content search configuration was moved around a bit in Sitecore 7.2 for instance. If you’re lucky, Sitecore has documented this somewhere in the patch notes. Thanks for getting back to me! This was also on a 7.2 instance. Turned out the patched config I was looking at (through showconfig.aspx) was lying to me about what file the patch came from.